Fionnuala McCormack opened her cross country season with a strong fifth place at the Cross de Atapuerca in Burgos, Spain today (November 12). 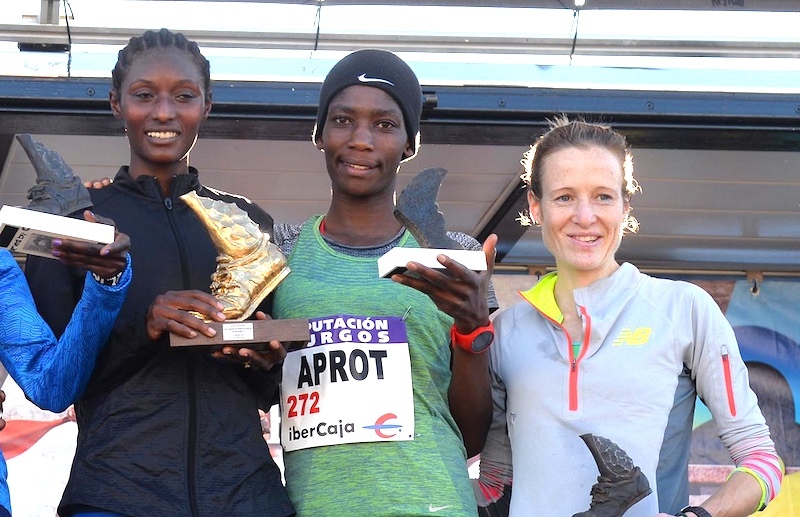 Race winner was the Ethiopian Senbere Teferi who outsprinted Margaret Chelimo of Kenya to win in a time of 25:21. McCormack of Kilcoole AC beat British athlete Steff Twell by a single place and eight seconds to finish the first European in 26:13. GB’s Lily Partridge finished eighth in 26:36 and finishing an excellent 15th was Kerry O’Flaherty of Newcastle AC in 26:50. Newcastle’s Zak Hanna finished 131st with a time of 30:13 in a high-quality men’s 9km race won by the Ethiopian Molla Getaneh in 24:35. Full results can be found here. Eoghan Tottan finished eighth in the men’s race at the British Athletics Cross Challenge in Milton Keynes. The Newcastle AC athlete finished in 31:02; winner was Mahamed Mahamed of Southampton AC. Race report can be found here. In Japan, Sinead Diver from Co Mayo, who is based in Australia, ran a time of 2:33:00 for seventh in the Saitama Marathon. Kenya’s Flomena Cheyech Daniel won the race for a second year in 2:28:39. Britain’s Charlotte Purdue was fourth in 2:30:34. At the Leinster Cross Country Championships in Scotstown, Co Wexford, Thomas Hayes of Kilkenny City Harriers won the men’s race from Peter Arthur of Liffey Valley and Gowran’s Niall Sheehan. In a good day for the Britton family, Una Britton of Kilcoole AC, a sister of Fionnuala McCormack, ran away with the women’s race in a time of 19:17. Second was Mary Mulhare of Portlaoise AC in 19:40, while third was Siobhra O’Flaherty of St LOT in 20:24. Senior results can be found here. Jamie Battle of Mullingar Harriers won the U19 men’s race, beating Adam Fitzpatrick of Kilkenny City Harriers and Jarlath Jordan of Tara AC. Best of the U19 women was Sorcha Maloney of Ballyroand Abbeyleix and District. Lauren Tinkler of Celbridge AC was second and Ella Richardson of Kilkenny City Harriers third. Underage results can be found here. Kevin Maunsell of Clonmel AC won the men’s 10km race at the Munster Senior and Juvenile Uneven Championships held in Galbally, Co Tipperary. Tim O’Donoghue of East Cork was second, with Ennis Track best of the teams. Winning the women’s race was Sinead O’Connor of Leevale. Farranfore Maine Valley were the first team. Stephanie Cotter of West Muskerry won the women’s U 19 race, with Waterford AC best of the teams. Leevale’s Charles O’Donovan proved the class of the field in the U19 men’s race. Donal and Conor Devane finished second and third, leading Ennis Track to the team victory. Results can be found here. In Cork, Mark Hanarahan and Laura Crowe were the winners of the HSE Cork BHAA 5km. Hanahan had over a minute to spare when winning the men’s race in 14:51. Crowe finished sixth overall in 16:37. Results here. Edel Monaghan from Enniskillen AC won the women’s title at the Northern Ireland and Ulster Novice Cross Country Championships in Stranorlar, Co Donegal. With a time of 28:07, she finished comfortably clear of second placed Kendra McMullan from Derry Track Club in 18:46. Milford beat host club Finn Valley by a single point for the team title. Winning the men’s title was Eskander Turku from Monaghan Town. Letterkenny AC took the team title. On the roads, Valdas Dopolskas of Balbriggan and District was a comfortable winner of the Greenhills 5km in Drogheda, finishing in 15:23. Second was Brian McCluskey of North East Runners in 16.10. First woman was Stephanie Byrne in 19:33. In Co Kerry, Freddy Sittuk of Raheny Shamrock bounced back from his Dublin Marathon fourth place to win the Listowel Half Marathon in 71:53. First woman was Dolores Duffy of Watergrasshill AC in 92:00. Full result can be found here. Sean Tobin from Clonmel AC has qualified for next Saturday’s NCAA Cross County Championships after finishing sixth in the men’s 10km at the NCAA South Region Championships at Tuscaloosa in Alabama. Tobin was leading his college Ole Miss to second place which means that they also make the finals. The winner was Gilbert Kigen of Alabama in 29:44.5; Tobin’s time was 30:15.7. The highlight of the Irish performance at the annual SIAB Schools International Combined Events Championships in the Emirates Stadium, Glasgow, was a victory for the junior boy’s team. Highest placed of the team was Iarlaith Golding from St Colman’s Claremorris who finished third with 3393 points – the best individual performance of the day for the Irish. One place behind was Jordan Cunningham from St Malachy’s Belfast on 3289 points. Finishing second behind England was the intermediate girls’ team led by Ella Duane of Cross and Passion Kilcullen, fifth individual with a personal best 3451 points. Just 43 points behind for fourth place was her great rival Lara O’Byrne from St Joseph’s Lucan. Both junior girls and inter boys finished third, with Ciaran Carthy from St Michael’s College Dublin only 44 points off a medal in boys’ intermediate and recording the day’s fastest times in both 200m and 800m. A link to full results can be found here.